So as it turns out, wedding planning has a way of taking over your life. I have done more advanced planning than I thought possible, but here I am going nuts with last minute details 4 days before the wedding! I must apologize for the scattered posts lately, and I do promise to get back to blogging (and also plan to do less complaining about my healthy diet) later next week when I'm officially wifed-up and it will be time to relax! BUT..before I go, I want to leave you with this gem of a recipe. You may remember me writing about the candied bacon pops I had at the Olive Cafe during restaurant week? Well, I was determined to make them at home and I must say - I came pretty close! I do realize, in retrospect, why they skewer the bacon, which I did not do. It is incredibly sticky and you will be a mess if you eat it sans stick- but it's so worth it! 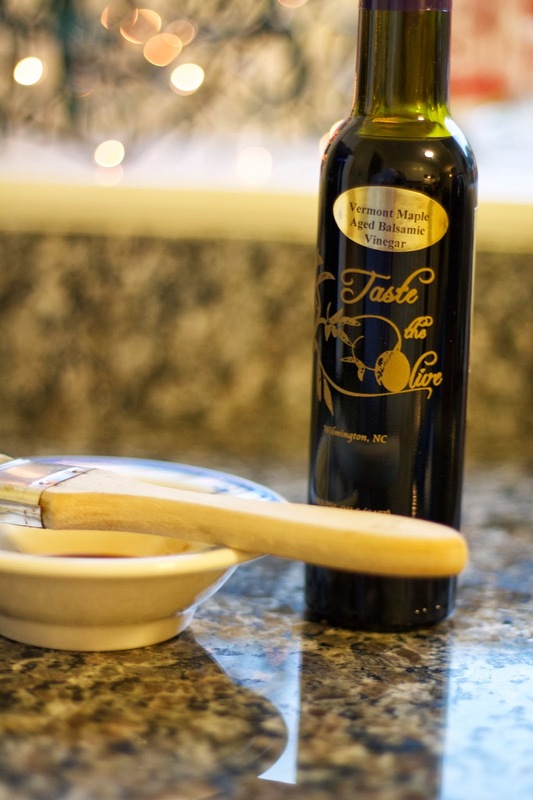 For this project, I purchased a small bottle of Taste the Olive's Maple Balsamic Vinegar. It adds that subtle maple flavor that goes so well with bacon, but if you don't want to invest in a bottle (it's about $12), you could always whisk a bit of maple syrup in plain balsamic for a similar effect. I find that the absolute best way to cook bacon is in the oven. I always start with a cold oven, turn it on 400 degrees, then walk away. 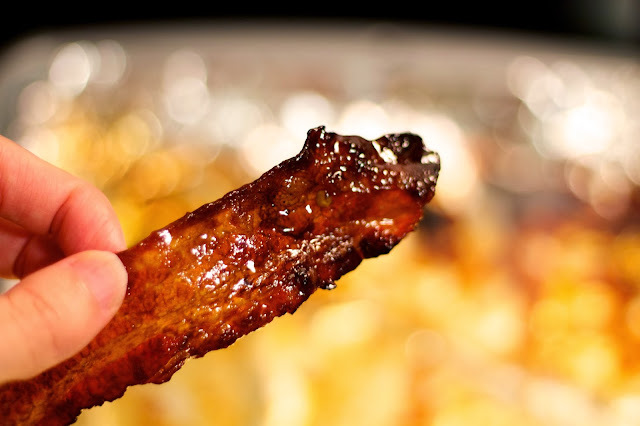 17-20 minutes later (watch closely) you will have crispy, mess-free bacon. This candied bacon is perfect on its own, but also made a great pizza topping with caramelized onions and bleu cheese. Enjoy! Combine brown sugar and crushed red pepper in a shallow dish. 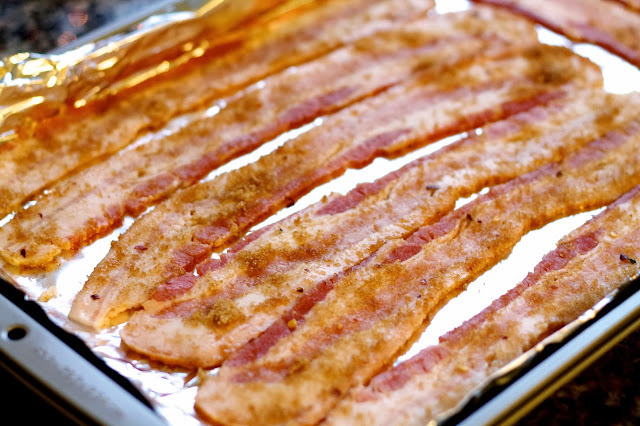 Lightly dredge the bacon in the sugar mixture and place on a foil lined cookie sheet. Brush on a light coating of balsamic onto the bacon. Transfer the bacon to a cold oven and turn the temperature to 400. After 17 minutes, remove the bacon, use a fork to flip it, paint a bit more balsamic on, and return it to the oven for another 2-3 minutes. Serve warm. Happy cooking and I'll get back to it when I'm MARRIED! eek! omg. that sounds so good. i love bacon. i know everyone says that...but i really do. i'll have to try this out! i'm a new follower and am going into stalk mode real soon...so you might be coming back to a lot of comments!